Just the cutest…I would just like a small tree with just them on it…so fun! O’ Boy those are just the cutest! OMG! Those are too adorable! You’re a doll Katherine, thank you so much for including Boomdeeadda in your post. I see you’ve been a busy girl, how cute. I wish I got half a much done as you do…Have a wonderful weekend, you’ve made my day. Very cute, I was making some rectangular ones similar to this in plain cotton. Adding lavender and painting a small design on top. They were great stocking fillers, as are these cute ones. Thanks for inspiring me. These are great! You always make it look so easy and yet professional – such talent. These are adorable. I have made some pillow ornaments as well, but like any creative person ours are very different. In mine I started with a cross stitch design. No, I haven’t unpacked my Christmas ornaments yet. I will post them when I do. Can these be any more cute? Cute and easy…perfect combination for ornaments, gifts, or stocking-stuffers! Thanks for sharing! Thank you! 🙂 They don’t have nearly the detail of your amazing pieces, but your work definitely inspires me every time I see it! So cute! I’m doing an ornament swap in Dec, so this may be just the ticket! Thanks! They are gorgeous, I love them. I just want to make some like this. Yes! I love making Christmas things…I just wait too long to start them and then I think, I will make them during the summer when I have plenty of time… well, you get the picture 🙂 Still, I love seeing the Christmas things that YOU make! These are soooo cute! You have the best ideas! Definitely super cute, but they look like they take ages! What a lovely idea. You could put 1-24 and make it an advent calendar as well. These are adorable! I love them and you could use them in so many ways to decorate! 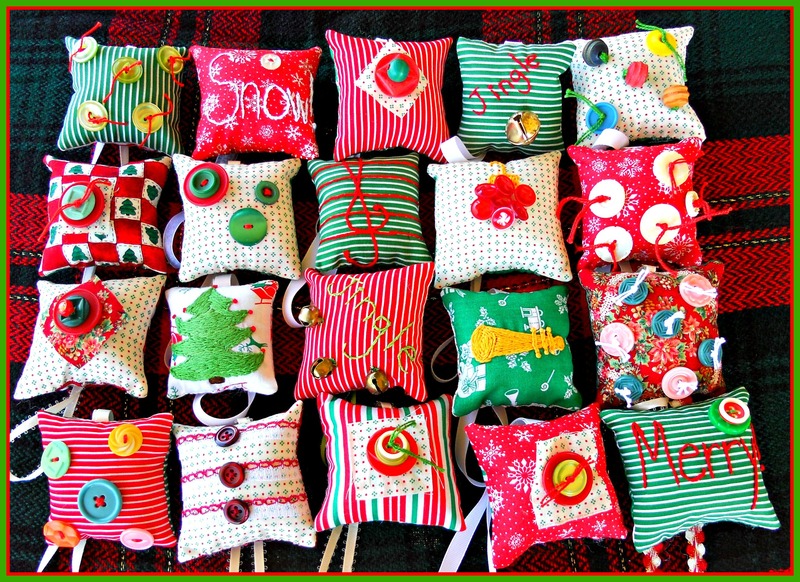 Have you ever done a mini pillow advent calendar? Ha! I just went and read the other comments and there was one about an advent set. These really are the cutest! I see these and think “pincushions”! LOL! They would be fabulous ornies too! I love being an enabler! LOL! I love this! I can see so many possibilities. What a great craft to do with children. What a great way to use up bits of fabric. Each little pillow is so unique. Thank you for the inspiration! These are adorable, I want to make some Christmas decorations on Monday for my next Monday make and I think I will be using some of your ideas! Thank you. what a cute collection! you’ve been busy. Wow…I want these on my tree and I have a whole bag of scraps waiting to be used. Perfect idea for them! Pinned!! so cute, i love to make at least one kind of ornament for all my gifts. i hope i get to it this year!! So cute!! I’ve made mini-sweater ornaments, but never thought of mini-pillows! I’m going to have to make some. Wonder if I could do a mini version of my entrelac pillow covers? Ooohhh . . . those would be pretty!!! These are too cute!! And what a large collection of them! I made some ornaments from my son’s art. Little stuffie like pillows. Nice! These are so cute– darling! Thank you for the link to my ornaments! I have done a silly thing though… I tried to change my blog’s username and in the process lost all the links to my old one. Would you mind changing the link from “ericagarrett” to “handmadetalesofdiyderringdo” so that it actually works? Thanks so much, I feel like such a luddite!